Pre-popped popcorn is becoming a popular alternative healthy snack to chips, which are often time deep fried. In addition to store bought popcorn, I've also tried making my own air popped popcorn at home. But it's just not the same as the quality and flavor from the store bought variety of popcorn. Being a new category of snack, there are not yet a ton of flavors. 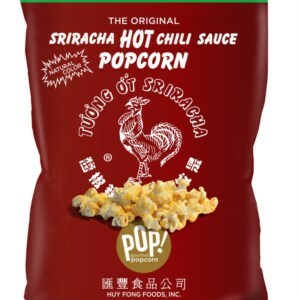 But one I've discovered that has stood out is flavored Sriracha Hot Chili Sauce Popcorn by Pop Gourmet Popcorn. The Sriracha flavor you know from their bottled sauces available in many Thai restaurants is not just spicy, but also flavorful! I'm not one who loves spicy, but I small addition of Sriracha perfectly complements many asian dishes. For that reason, I decided to give this brand of popcorn a shot and was surprised how well it goes with popcorn. The first bite of Sriracha popcorn I had was overwhelming because some of the powder got into my nasal passage and there was a light burn. The rest of the time, my mouth was burning from all the popcorn. It was spicy, but still flavorful enough to distinguish the sriracha. For those who are interested, this was available at my local Costco.